The Shooting Spiner (Female) (ブッパナシグモ（メス）?, lit. 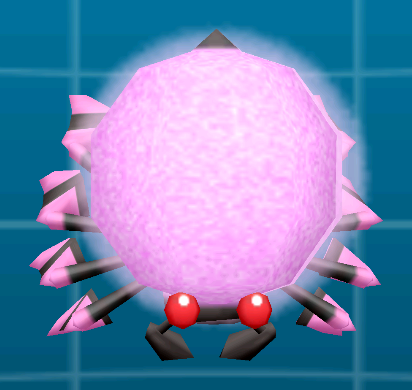 : "Firing Spider (Female)") is an enemy found in Hey! Pikmin. These spider-like creatures hang from strings of web, lower down to Pikmin level, and stretch their legs out to stab Pikmin and kill them. Much like Sheargrubs, this species has notable distinctions between the males and females. Female Shooting Spiners patrol their webs until Olimar moves nearby. In this state, they only detect him by horizontal approximation, meaning it doesn't matter how far away vertically he is. They also don't actively target the Pikmin. Once they spot the captain, they hang on through their string of web, and start lowering until they're leveled with their victim. Once this happens, they spin around a bit and spring their spiny legs to try to stab Olimar, regardless of him being in reach or not. Any Pikmin that are touched by the extended legs will be killed, and Olimar can also take damage with this. They then retract their legs and climb back up the string. After climbing the entire thing, they go back to their initial state. If while they're trying to come to the same level as Olimar, he ends up moving too far away horizontally, they will just spin and extend the legs right there, and then go back up. Back-and-Forth Road: They appear most frequently here, usually in groups of two or three, and next to vines. Steel Pipe Forest: There are only a few here, found alongside some male varients. The player has to dodge the projectiles the males shoot, while avoiding the female's deadly stabs. Terror Trench: Only a few appear in this area, where they will hang just above spiked pine cones. They act as another threat if the player manages to avoid the pine cones. The female Spiner can be taken out in a single hit with a Pikmin. Be cautious to time a throw so the Spiner's legs will be retracted when the Pikmin lands. This means you should either attack before or after it does its own attack. If you need to lure it down, you can do so safely. Carefully inch your way closer, and once the creature starts going down its string of web, stop. You should be far enough away for it to not reach you with the legs. A female Shooting Spiner idling, waiting for prey. Mid-spin, in preparation to attack. Legs contracted, getting ready to be sprung out. Several Shooting Spiners in Back-and-Forth Road. This page was last edited on March 5, 2019, at 11:58.